Following the fire, Edward Brown and Chester Treloar recruited local residents to pursue the creation of a fire company. Township Committeeman Dan Wilbert advised them that the fire company could not be formed unless permission was approved by the residents. Chester Treloar then had legal papers drawn up by Percy Camp Esq. and presented them to the Township Committee. On December 7, 1928, with sixty-three members present the first meeting took place at Community Hall. 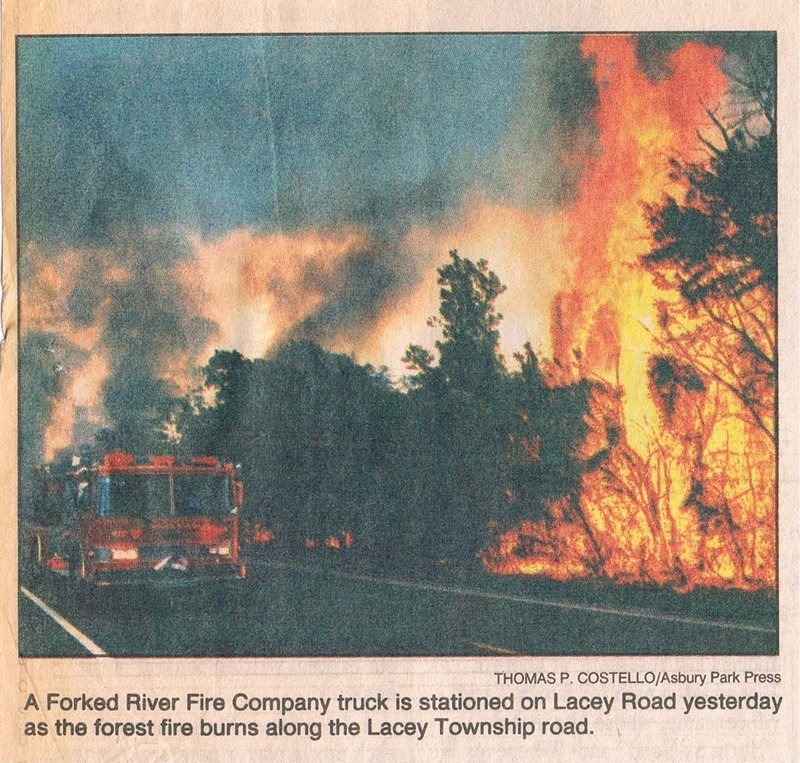 The organization was named “Forked River Volunteer Fire Company of Lacey Township” and the first officers elected were Chief Chester Treloar, President Malcolm Dunn, Vice President Edward Brown, Secretary Fred Barkalow and Treasurer John Irving Grant. On April 12, 1929, under the leadership of Chief Chester Treloar and President Malcolm Dunn, the department became incorporated. The first fire apparatus was purchased from Hahn Motors in Pennsylvania. It was delivered in August at the end of a three-day carnival and stored in a garage until a firehouse could be built. The Ladies Auxiliary was established in 1929. On July 19 their first meeting took place ay Fidelity Hall with eighteen members present. The first officers elected were President Lillian Cranmer, Vice President Mrs. DeLori, Secretary Helen Wilbert and Treasurer Agnes Gray. The women played a big part in the development of the Fire Company by helping out with fund raisers, such as oyster dinners, shooting matches and carnivals. In 1929, despite the United States entering into the Great Depression, the members of the Forked River Fire Department and the Ladies Auxiliary pushed forward in establishing a fire company. The most difficult task was building a firehouse. Due to economic times, the members decided to purchase the Fidelity Hall building on Route 9 from Al Grant for a nominal amount of money. It was relocated to Station Drive during the winter by using a combination of horse, logs and ice. 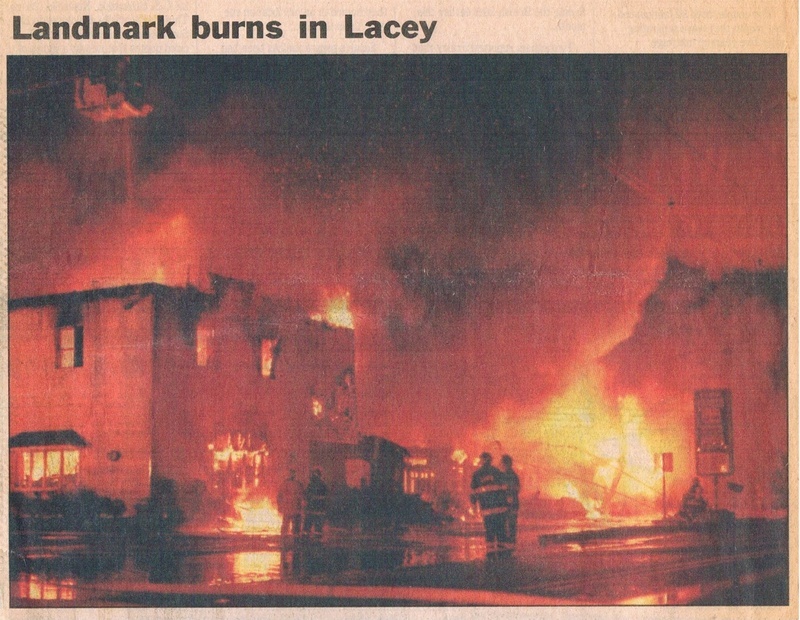 Once complete, the Township of Lacey appropriated a budget of $800.00 for maintenance, insurance and utilities. In 1930, there was a need to transport equipment and manpower to fire scenes. Forked River's second fire apparatus came into service when the Ladies Auxiliary purchased a 1926 REO Speedwagon Hose Cart. In May of 1930, Ocean County saw its worst series of forest fires ever recorded. 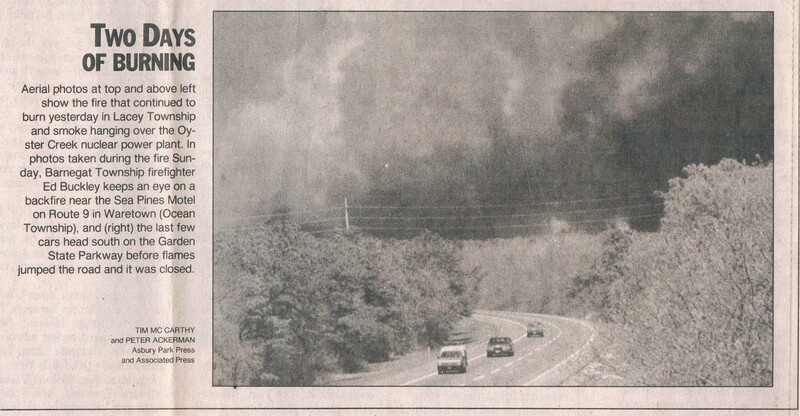 On Sunday, May 4th, a forest fire started just north of Whiting, by the Blue Comet train traveling through the Pinelands. The wind drove the fire directly into Forked River causing widespread panic. Mutual aid was called in and fire trucks were staged in different parts of town to protect structures from flying embers. The fire nearly destroyed the township burning 30,000 acres all the way to Barnegat Bay. The Presbyterian Church and thirty structures were lost. In the forties, when the men went to fight in World War II, women found that their role and responsibilities had changed. To help protect the residents of Lacey Township, the women had joined the Ambulance Corp causing the Ladies Auxiliary to dissolve. It wasn't until 1957 when Stella Wilbert had re-organized with a group of twenty-six to bring them back. On June 5, 1957 the first re-organization officers were President Bertha Trelvar, Vice President Dorothy Buntain, Secretary Dorothy Grant and Treasurer Rene Clayton. The current location of the Forked River firehouse was built in 1962, on a lot donated by James L "Dub" Parker in the late 1950's. The adjacent lot was purchased from Harold Tilton for $16,000 and the lot behind the museum was donated by the Township of Lacey. Six years later, after working weekly Bingo games, the mortgage was paid off. On October 12, 1968 a triple celebration was held for the burning of the mortgage, the department's 40th anniversary and a housing for a 2000 gallon Great Eastern Tanker. Today, a long line of traditions continue as members of the Forked River Fire Department strive to provide the highest quality of service and protection to our community through training, preparedness and prevention. This forest fire started just north of Whiting by the Blue Comet train traveling through the pinelands. 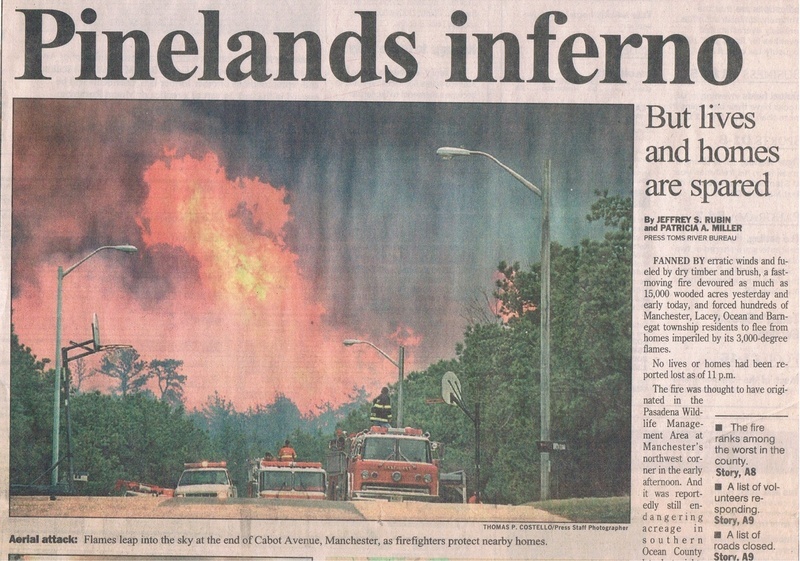 It burned 30,000 acres all the way to the Barnegat Bay. In Forked River, a church and approx thirty structures were lost. Fire destroyed the historical landmark built in 1879. Firefighters pumped water out of the Forked River to battle the blaze. This forest fire burned 75,925 acres in the Pinelands. 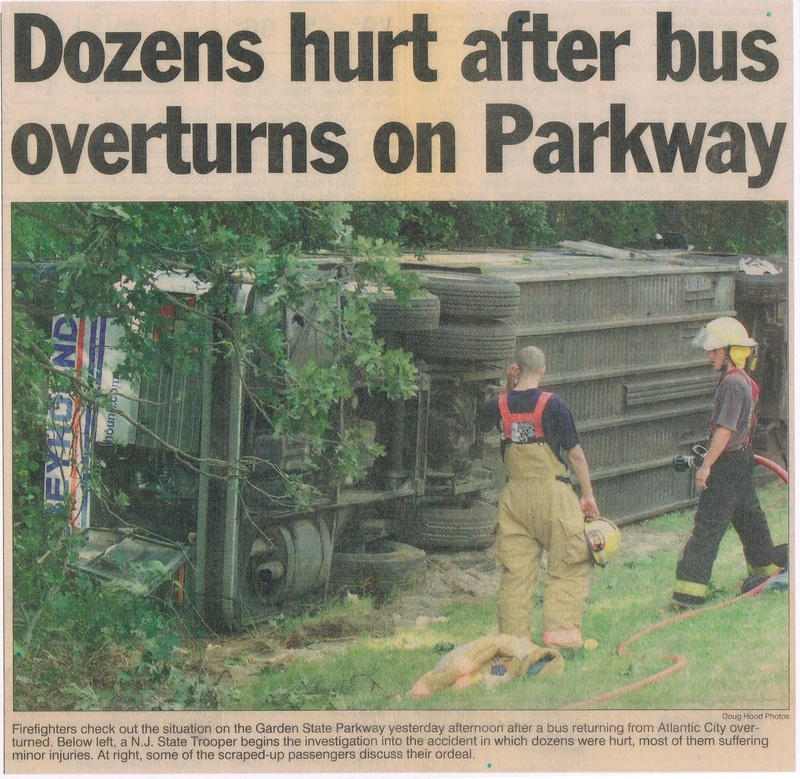 It was stopped west of the Garden State Parkway, in Forked River. 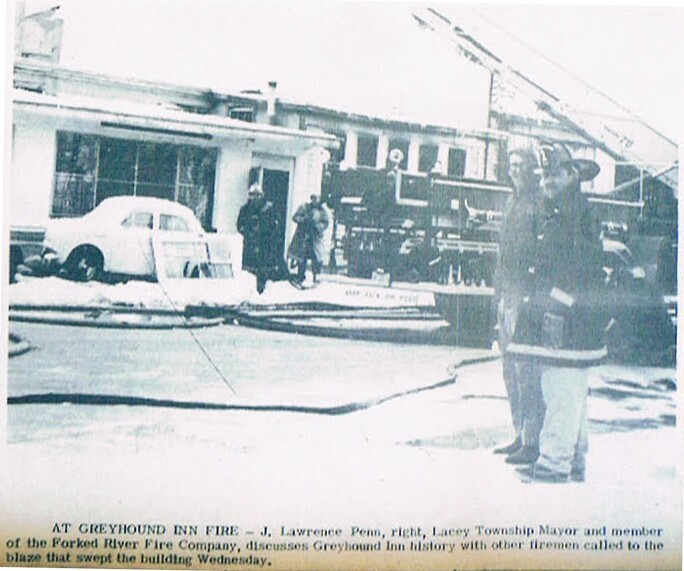 Fire destroyed the Historical Greyhound Inn located on Route 9 by the State Marina. Currenlty occupied by Rite Aid. The inn was a shore landmark for 80 years. Mutual Aid was provided by Lanoka Harbor, Waretown, Bayville and Toms River. 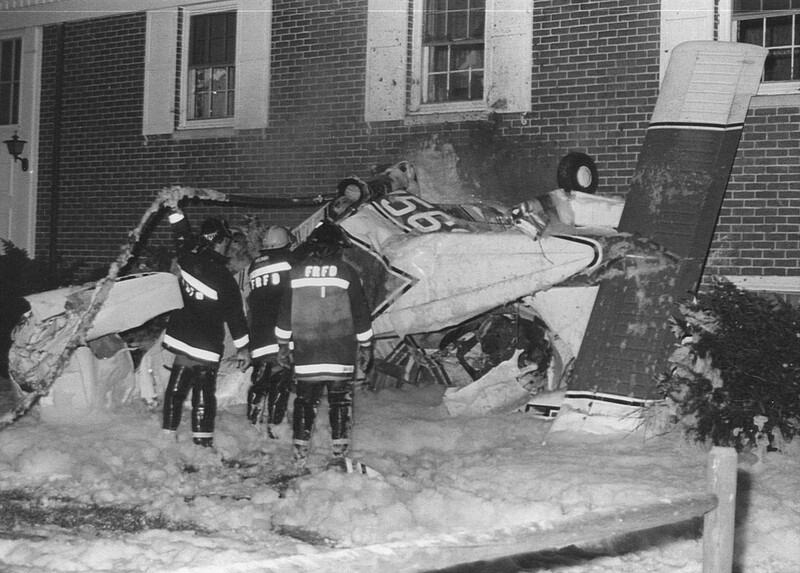 A plane crashed into the Methodist Church on Route 9 killing five people. Firefighters used foam to prevent leaking fuel from igniting. Fire destroyed this restaurant located on the Garden State Parkway. Due to the lack of hydrants numerous fire departments responded with tankers. An Augusta 109A helicopter crashed into the median of the Garden State Parkway at mile marker 72. Five people were killed, the pilot, co-pilot and three high-level executives of Donald Trump’s Casinos. A truck carrying a portable car crusher, traveling southbound with its booms up in the air, crashed into the Lacey Road Overpass . The accident shutdown the Garden State Parkway and Lacey Road. The bridge was replaced at a cost of five million dollars.